Its calling name may sound funny, "Pinocchio rex", but do not laugh at the cousin of T. rex the famous meat-eating dinosaur is a strange and has a long snout, because it can take you alive. Scientists on Wednesday, May 7, 2014 has identified a new member of the Tyrannosaurus rex families, the beast named Qianzhousaurus sinensis has a length of 9 meters and living in China at the end of the dinosaur age. Name Qianzhousaurus selected based on where of the fossils discovered. The species name, sinensis, indicating its origin from China. This dinosaur is different in several aspects from the members of the carnivorous dinosaurs group, known as tyrannosaurs, especially since they have a longer skull than T. rex. "This is a new generation of tyrannosaurs, with a longer snout and a lot of horns on the skull, and very different from the skull of T. rex which has a short snout, straight, and muscular. So tyrannosaurs was ecologically varied than we thought before," said Steve Brusatte, a paleontologist from the University of Edinburgh in Scotland, who is also one of the researchers. Its longer snout make the researchers gave the name of "Pinocchio rex," inspired by the wooden puppet who dreams of becoming a human but his nose grew longer every time he tells a lie. "Its long snout, reminds us of Pinocchio and his long nose, so Pinocchio rex seems a fitting name," said Brusatte. 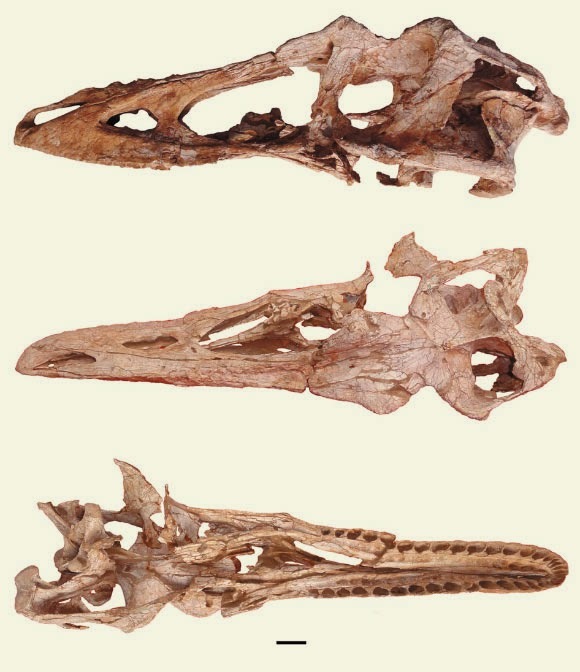 Two fossilized dinosaur with a long snout previously found in Mongolia but both specimens were a teenager. Brusatte said it was unclear whether a long snout which is found in the specimen will disappear when they reach adulthood. "Recent fossil closing the debate because of its snout has a size two times longer than the two Mongolia specimens and much more mature, and besides has a long snout and it also has a many of the weird horns. So this feature is not a feature of the children or adolescents, but the distinctive and unusual feature of the sub-groups of the long snout tyrannosaurs," said Brusatte further. Qianzhousaurus lived about 66 million years ago, not long after a 10 km wide sized asteroid that believed hit the Earth and wiped out the dinosaurs and other creatures that exist at that time. "Sub-groups of dinosaurs was probably the last dinosaur survive and witnessed the asteroid hit impact," said Brusatte, whose research was published in the Nature Communications journal. Qianzhousaurus smaller than T. rex, which lived at the same time in North America, with a length of approximately 12 meters and is known as the largest land predators. Although it has a "big smile" like T. rex, the unique Qianzhousaurus snout and more slender form suggests that they liked different types of prey than usual tyrannosaurs, said the researchers. "It's much more bigger," said Brusatte. "And still got a long sharp teeth. You definitely do not want to meet them. Much smaller than T. rex, but T. rex was the fiercest predators of all time." 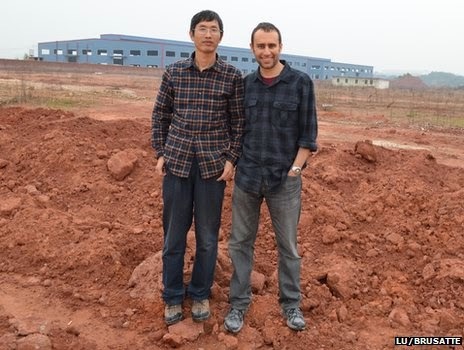 Fossils were found in good condition by the construction worker at a site in Jiangxi province in southern China. 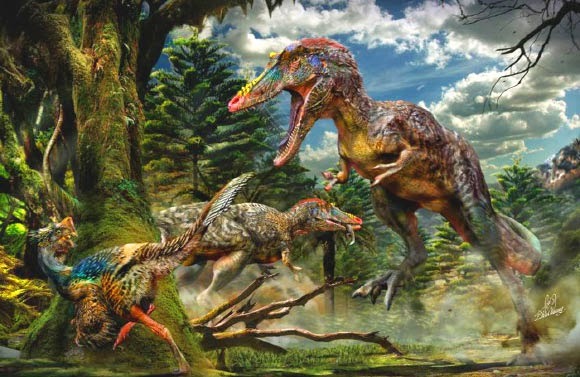 Qianzhousaurus live in relatively wet landscape, lush, and full of dinosaur including dinosaurs similar to birds and furry like Banji, Ganzhousaurus, Jiangxisaurus and Nankangia which may be Gannansaurus their diet includes a large and long-necked.